As a team who work every day to supply evidence and good practice to our clients in the public sector and consultancies, it would be easy to feel a bit down about the ease with which the idea of a post-truth world has taken grip. In fact however, it’s heartening that so many organisations continue to recognise the value that our service brings. Not only does it offer a continuing professional development resource for staff, it also acts as a channel for knowledge sharing between organisations – helping them when they have to review services, look for efficiencies, or transform what they do in light of changing government policy or priorities. The Idox Information Service is a membership library service, which was established over forty years ago – originally under the name of the Planning Exchange. At the outset, the emphasis was on the provision of resources to support professionals working in planning and the built environment in Scotland, but over the years we’ve expanded our subject coverage to cover the whole spectrum of public sector information, and across the UK. Public policy is an ever-evolving subject and so current awareness services are a big part of what we do. Members can set up their own subject alerts on anything that interests them, and we also have a set of weekly and fortnightly updates on common topics. Last year we added three new current awareness updates on Devolution, Smart Cities and of course, Brexit! UK grey literature is a particular strength of our collection. We spend a lot of time sourcing documents such as technical reports from government agencies, and research reports produced by think tanks, university departments, charities and consultancies which are often overlooked by other databases. Recent research has highlighted the value of grey literature for public policy and practice. 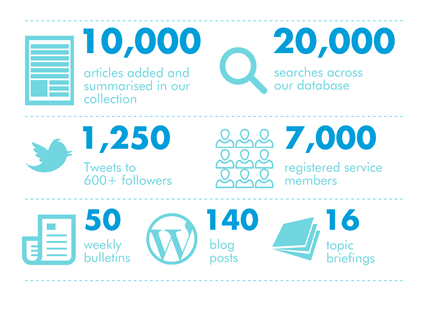 The interest from members in using our Ask a Researcher service has been increasing, due to the time pressures and other challenges that people face in sourcing and reviewing information. An example looking at the links between employee wellbeing and productivity is on our website. Members regularly comment on the usefulness of the results, and it’s satisfying to be able to make a direct contribution to their work in this way. While our online database allows our members to search for and access resources themselves, there is a strong personal element to our work. Hopefully, this article has provided some insight into the way that the Knowledge Exchange supports staff and organisations across a variety of fields. More information about the service can be found here. In 2015, the Idox Information Service was recognised as a key organisation supporting evidence use in government and the public sector. It was named by NESTA / Alliance for Useful Evidence / Social Innovation Partnership in their mapping of the UK evidence ecosystem. We also contribute data to the Social Policy and Practice database, which focuses on health and social care evidence, and is a resource recommended by the National Institute for Clinical Excellence. This entry was posted in Arts, culture and leisure and tagged #km, abstracting, blogging, careers, case studies, cilip, current awareness, databases, evidence, good practice, government, grey literature, idox information service, information, information professionals, knowledge, knowledge management, librarians, libraries, library services, literature reviews, policy, policy makers, practitioners, public policy, public sector, research, social media, social policy, special libraries, The Knowledge Exchange, think-tanks, universities. Bookmark the permalink. ← Is it time to start building on the Green Belt?